I love this George Bernard Shaw quote, and have used part of it myself on a previous post. 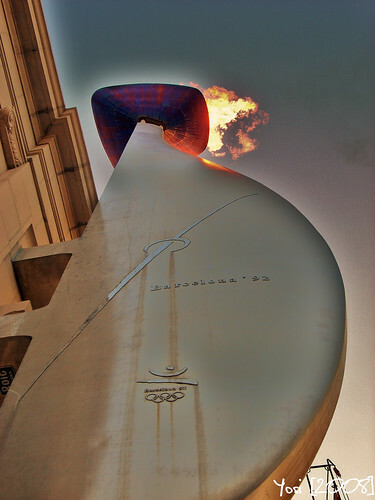 Your picture of the Barcelona Olympic flame makes the quote ten times more powerful, as usual. And I get to be third! Which is no shame when it’s after Daphne and Davina. I’m guessing that if this quote is any indication of his true attitude to life then it might explain why he lived to the age of 94! It’s a really wonderful quote and thanks for sharing it, Lance! Isn’t that a marvelous quote. Thank you for blessing my day with it. Actually Sunday is almost over for me. LifeMadeGreat | Juliet´s last blog post..Would You Prostitute Your Blogging Style? Great quote today Lance. My favorite line is “I am of the opinion that my life belongs to the whole community and as long as I live, it is my privilege to do for it what I can.”- I agree. we are not here to live selfish lives, we are here to live together as one, helping each other succeed, loving each other, because when it is all over, we want to leave this place knowing we touched lives for the better. Thanks Lance! “I want to be thoroughly used up when I die, for the harder I work, the more I live.” Love this part. Reminds me of the thought that you have to experience life with no regrets. Live life as fully as possible. @Daphne – I’m laughing! Yes, and you’re always ahead of me Daphne – you’re everywhere! The Olympic flame, I felt that really exemplified the “torch” part of this quote – a light that shines brightly ((like you!). It’s always great to have you here, and that you’re thinking about this ahead of time – that’s a touching gesture to me – thank you. So…when do I put these Sunday posts together? Well…the truth is – I have a couple setup to go if I really need something, am short of time, etc. Usually, though, it’s a Friday or Saturday activity to put this together. I’m just not disciplined enough to plan in advance very often! @Davina – Yep, Daphne’s quick! And…she’s got an advantage of being ahead of us by many hours!! She’s wide awake, and I’m still groggy! Happy Sunday to you too, Davina. And right back at you – your site is a powerful example of keeping that splendid torch – just look at the recent “Quote Effect” Ebook you created – what a powerful example of burning brightly, and including so many others in the process! @Ian – You’re right Ian – following these two fine ladies is a great honor! And with Mr. Shaw living until 94, it really does say something about what attitude plays in longevity, and in having a great life! @Sarah Lulu – It IS marvelous, that’s a great word to describe it! So, I’m glad you could end your Sunday with this, and over here, we’ll start it out on this note! Have a great night! @Jay – Living in community, it’s a great thought. And when we live this way, when we can impact others, and allow others to impact us – what a connection that is developed! And what a way to make a difference in our world! You’re doing that Jay! @Rupal – Live life fully — there’s no better way! Whatever “fully” is for you. And that’s what makes our world so amazing – is that we can all do this in our own unique ways – and when we do – we really can leave the world a better place. And with no regrets. Keep on doing that Rupal! I’m with Jay — that part of the quote is what really struck me though the whole thing is brilliant. Thank you for sharing — I had never heard that before. I also love the part about being a force of nature. When I was ill I did feel like the world was against me. I agree that we are in charge of knowing WHAT will make us truly happy and working towards getting there. Thanks Lance, awesome as always! I like the idea of being a keeper of a torch before handing it off to future generations. Nice idea. Thanks for the thoughtful qoute! Hi Lance, That is a great picture and an even greater quote. Living life to the fullest! I think that I am just learning that doing what a person loves is very important. We are trying to raise our son to do what he has a passion for, not necessarily what he can make the most money doing. Of course we don’t talk about the money aspect of it, that would be lost on a 4 yr old. But talking about things we love to do and how much happier daddy is, and we are as a family, with daddy doing what he loves! I also think that doing what you have a passion for, what makes you happy, makes you more available to the community. Natalia Burleson´s last blog post..It was a fun day! I agree that we all have a purpose in this life. The trick is knowing your heart, trusting God, and going for whatever that purpose is. If everyone could actually figure out what their purpose is….wow, what a world it would be! Hi Lance – I love the Bernard Shaw quote. And the pic is awesome. But i need to find my glasses as I couldn’t work out what it was at first, even though it has the Olympics symbol on it. What an awesome way to think of your life! I am feeling inspired today! Sometimes the “act of doing” can be a very tiring thing………but on the days I didn’t try as hard, even though I’m not as worn out, I feel like I missed out a little bit on life that day. Hoping to burn bright today and all month 🙂 I resolve not to live life on auto-pilot! Do I recognize my purpose as being mighty? It took me a long time. Now I only work part time and have to remember I’m an ordinary person doing extraordianary things. I have to put value on my writing, hiking, running, golfing and spending time traveling, volunteering visiting my grandchildren and children in my now mostly leisurely life. The joy and value of my mighty purpose comes from accepting these as gifts, living in the present moment making our world a more loving place. Fantastic quote! Happy Sunday Lance! I sometimes feel so exhausted from the big pile of things on my desk that I feel as if I need to discontinue my blogging life. And then, I will stop to think about how enriched I have become, just by serving others with the words I publish on my site. I know that I will not have it any other way. If I can impact at least one life, I am already happy. Hopefully, what I do is enough to inspire the future generation – namely my kids – to carry on lighting the torch for others in years to come. Hi Lance – Hmmm, this quote speaks to the idea that what we can do for others is also the same thing that makes the torch burn bright in us. (Really nice picture, by the way.) I like the idea of our lives being something “great” by what we can do for ourselves and others. Lance, you have quoted one of my all time favorite quotes, that I have used in thousands of communications. I am not exaggerating. What a quote from a man who lived it. I sometimes feel I am surrounded by a number of people who feel like that, but they also have such blinders on that it is impossible to break through their wall to help them and allow them to see the freedom that sits just outside of that wall, when they stop limiting themselves in how the world has “wronged” them. Evita´s last blog post..The Quote Effect E-Book – What Effect Will It Have On You? Very inspiring Lance! May I be able to live my life that way. We are capable of so much more, aren’t we?? Living our true potential would be such a joy. Jewel/Pink Ink´s last blog post..Got Good News? He was one cool and smart man. I’ve been a fan of his writings for many many years. And now this quote – can I be a George Bernard Shaw too? Jannie Funster´s last blog post..Why? This really inspires me. It reminds me that I have a duty to keep the torch of life brighter each day so that it can make tomorrow brighter than today. It is also very important to always remember that the world will not end when I die, but will be there for generations to come. WOW! What a quote. Thank you Lance. Also, big hug to you for your comment you left on my blog. I am overwhelmed with the support and love that has been poured on me. It’s funny, I didn’t consider the impact we make as bloggers. It is amazing what we all give and receive. Although it’s in a virtual world…it is so real. It’s blowing my mind right now. I have never heard this quote before, bits and pieces for sure, but it was great to see the whole thing and to find out who said it. I have several people in my life that think the world owes them and the tenacity of these people is amazing. They never give up trying to get the world to serve them. I just wish they could know that they are a clod of ailments and grievances. That said, I walked through my own many years of being a clod and didn’t really know it. By the grace of God, the truth was revealed to me (hitting rock bottom will do that) and once free from my all engaging self, I strive to not return to that person. Awareness is everything. Of course the world will not itself to making you happy. I think that is the biggest lesson we need to learn. Other people cannot make you happy. Money can’t. Material things can’t. Only you can. It is fine to think of that in the bigger sense. But sometimes, on the day to day situations, emergencies and dealings, we tend to forget this, become upset, mope and blame the other, the job or the whole wide world. Although I know this, I am still learning to put it to practice in everyday life. I believe that we all have the same ardor to live the best life we can, to love and give, make people happy, shine our light, make the world – or just a tiny part of it – a better place, accomplish something that we hold dear. THanks for shining your light in blogoshpere. Hi, Lance. Happy Sunday! I think this quote can be condensed to two of his sentences: “This is the true joy in life, being used for a purpose recognized by yourself as a mighty one” [emphasis on “being used”] and “I rejoice in life for its own sake.” These two create a complete, fulfilling circle. Once I understood my own unique, individual purpose and of being an instrument toward that end, the act of living life itself became my joyous reward! Sure, I falter and slip and even fail completely, sometimes, and I kick myself for it—but then the purpose calls, and I offer myself, and the birds start singing, again, and life is beautiful! I love this quote – I’ve read it before but it’s always worth reading again. I want to be a force of nature and will continue to do my thing, waiting for when preparation and opportunity collide. I will continue to move my ideas into reality, one by one, until I create the ultimate gift to the world that I was born to share with others. Loved this quote Lance, it spoke to my heart and soul. If that quote doesn’t move your soul then check your pulse. That was a glorious quote. A lot of times we avoid work so to make life feel easier. We neglect the fact that we don’t feel useful. This lack of use makes us more tired and even more lazy. We have to build a life that helps others. If we don’t we live an empty existence. Yes, Lance, Let it burn! I live for Sundays. I am in such a good mood right now. I have decided (again) not to let the little things get me down. Life is precious and short. And too much time is wasted worrying and stressing. This quote reminds me to live my life to the fullest and let my little light shine. So I’m gonna. I’m shining, Lance! Arswino´s last blog post..I Want To Be Extraordinary !! Thank you, Lance, for always reminding us to live in heart and soul! @LisaNewton – If we’re living each day to the fullest – if we’ve done this – and have done this listening to our heart – we have succeeded. Thanks Lisa! @Jenny Mannion – Belonging to the whole community is a wonderful thought. If we all thought like this – like we belonged, and as part of that we contributed selflessly – what a more wonderful world we would live in. Especially if this wasn’t’ just one village becoming a community, but really the whole world becoming both community-minded and feeling a real sense of belonging. Jenny, you are a shining example of this in action – I really believe you live this, your torch shines brightly! @David – I really liked that too, David. If we think about those who will inhabit this place once we’ve moved on, then being the keeper of one of the torches shining into that future is an important one – for each of us. And I find that to be inspiring as we prepare this world for the future by what we are doing today. @Natalia – I loved them both, too! I think we all evolve toward that point – doing what you love. Whether we get there or not, that’s another question. And you are raising your son wonderfully Natalia! Going after your passions in life will make life so much more fulfilling. And the money…money can be tempting. It’s tempting for me. What’s really pretty cool, I think, is that you are living it. Your husband is living it. What you speak to your son, then, comes from the heart. And yes, I think if we develop our passions, they can become part of the community, and part of us making the world a better place, through what we are passionate about. @Cath – This photo, I believe, is the Olympic Flame from the 1992 Barcelona Olympics. And the whole idea of a torch struck me for the photo – and what better than the Olympic Flame? A torch larger than life adn symbolizing all of our nations together as one. And there is true joy in that thought! @Annette – This was really the thought that jumped out at me in this whole quote too. And the inspiration for the photo today! And you’re right – the act of doing – it can be exhausting! When we give it our all, when we go all out, even if it makes us tired – if we’re doing this out of love, from the depths of our soul – it will feel right and good. And I happen to think, Annette, that you to a very excellent job of holding that torch, and keeping it shining brightly! @Tess – What you’ve written, Tess, is beautiful! Your purpose is indeed mighty. And I can tell you value what you do very much – and that speaks to what’s in your heart. You DO make the world a more loving place – just from what I’ve witnessed here and at your own site. Continue to do those things you value (like visiting the grandchildren) – you are doing great works! @Mark Salinas – Thanks Mark! And a very happy Sunday to you and your family as well! @Evelyn – Evelyn, I have that same feeling some days! And then I think the same thing you do – how enriching it is to write and engage with so many talented people from all over the world – really giving new perspectives on so many things for me. And consider yourself happy Evelyn – you have impacted my life, in very positive ways! And I have a pretty good feeling your kids will be given a well-used torch, and one that shines brightly. Their mother is doing much good in this world – they are indeed lucky to have you! @Amanda – I really struggled with the right picture for this, even after I had an idea what I wanted to use. Finding one that really fit what I was hoping for was difficult to find. Then I found this, and really felt, with the flame, and the looking up, that it was exactly what I was looking for. And then your comment to the torch within us – that’s such a great way of looking at this. As we do for others, that torch within us gets brighter and brighter. Love the thoughts today Amanda, thanks much! @Rummuser – Well, that’s pretty cool! It’s been a long time since I’d heard this quote, and when I saw it again, wow, it just seemed to fit with where I’m at right now. So, hearing this is a favorite of yours, and one you’ve used many times over – fantastic! Thanks Ramana! @Evita – It’s so easy to “blame”, isn’t it. We all have, within us, the ability to have a full and happy life. We do need to take an active role in our life, and in making it what we desire. And when we tie that into the making of a community, that really adds to our blinders coming off… so we can see what goodness there really is in our world. @Lizwi – We CAN leave the world a better place, and we can keep our torches lit and shining brightly – a great message, isn’t it! Great to have you here today! @Caroline – It really is a powerful quote! I recall starting out, and how blogging seemed distant, remote. And,over time that has really changed. It IS real. In amazing ways, it’s real. It’s not just an unknown person leaving a comment anymore. It’s someone I know, someone I consider friend. You. So, know that I think wherever the future leads you to, it will be the right place for you. And, know that you have support here always, as well as many other places, I’m sure – from the comments I’ve read on your site. @Audra – This whole quote, all together in one spot – really says so much. For some, this just doesn’t click. And if/when it does – what a moment it will be for them. Life looks so completely different when you view it as abundance instead of scarcity. I’ve been that clod too, not knowing it. And I think that’s part of it – people don’t necessarily realize the “woe is me” attitude they spin sometimes. All we can do is continue to support these people, with gentle brushes with what life can be like. At the same time, it’s important that we also have the uplifing associations too, so we don’t get pulled back into the fray of scarcity. “By the grace of God” — powerful statement Audra, and I love that you’ve used that here. Our God is an awesome God! And one of His most awesome things is grace… And the test, yes – let’s make it simple one that anyone can take!! @Mimi – That is so much “it”, Mimi! Only we, ourselves, can truly make us happy. It’s not something we can buy in the store, or solve with a bigger paycheck. Hey, you’ve seen me Mimi? (I have moped before!). And a very true and raw-honest statement – all you know this, putting into practice isn’t always easy. Thank you. It’s not. And if I’m shining my light, it’s really a reflection off of all the wonderful people who stop here and share their light – that really is the amazing light that shines from here! (and thank you Mimi…). And same to you, have a great Monday! @Frisky Librarian – It is worth reading manay times over! Thanks for stopping by! @Karl – This is a very moving quote – it does go straight to our hearts and souls. To the idea of working and being all used up is a great thought – and when put into action – a true testimony to what this really means! Do work that speaks to your heart, and live! @Angel – Hey Angel! “Life is precious and short.” – I love this statement, and I do because it reminds me that I’ve got one shot here on earth – and I also don’t know how long that shot is. And that speaks to urgency – to looking “now” to find that which speaks deeply. Angel, your light isn’t little at all. You are shining Angel – you are shining brightly! @Arswino – My favorite line in this one too! Continue to shine brightly Arswino! @Henie – I’m pretty sure you’re one of those who “gets” this, Henie. Living in the heart and soul – is a place where true joy resides! And being of a giving spirit – that’s just another way we can be a light into the world! “I am of the opinion that my life belongs to the whole community” – what an unusual perspective. We tend to be self-centered – perhaps giving to our immediate family but often feeling reluctant or ambivalent vabout giving to the bigger community. Wow, Lance! One powerful sentence after another by Shaw — and a powerful photo to top it all off. Thank *you* for making my Sunday (night) richer! Linda Abbit´s last blog post..Funny Fridays 2/27/09 — Because It’s Better to Laugh than to Cry! Great quote. I agree with Vered and thought that was an interesting part of the quote that Shaw would mention community. He did live in a different time than we do today. They may have relied on each other more than we do today or at least there may be that perception. Thanks for the post Lance! Always such words of wisdom over here! Thanks for that. Lance, this is SO how I feel and I’m beaming to have read this here! We all should feel this way EVERYDAY of our lives. I truly enjoy your blog!! Tabitha in Bliss´s last blog post..A Delicious Day! How splendid Lance! I have been thinking about so much of this lately. It is what brings so much happiness – thinking outside of myself to truly make a difference in the time I have. “I want to make it burn as brightly as possible before handing it on to future generations.” – What great words to live by! I like that sentence. I think that too many people blame life and circumstances for the way things are, rather than taking responsibility themselves. They end up tossed around by life and never really get anywhere, though they may talk a big game. We’re all obligated to find our life’s purpose, and live it to the fullest. George Bernard Shaw’s view is profound and invites reflection. And yet, no energy being is separate or ever used up. An energy being cannot exhaust spiritual immortality. Some people evolve to sense that working harder is not necessarily smarter or better. To rejoice in being present now is to recognize time does not exist and no being is mightier than any other. Liara Covert´s last blog post..What is the universe telling you? The contents of this clever ebook remind people they are doing things part of them thinks they are not. You remind readers that dead language is very much alive. Every being lives a Zen koan. “I rejoice in life for its own sake”… I think we live better lives when we wake up each morning and the first thought is that we are so grateful and happy to be able to wake up, to go out and LIVE and do what we choose. @Linda – Thank you for stopping by Linda! Each line in this quote is so powerful! @Stacey Shipman – There are lights out there that guide us – voices of hope for us. And, just like there are people who shine light in our life, we have that opportunity to shine light for others. You’re doing that Stacey! Keep shining! @Happiness is Better – I think we are more isolated today. There are so many distractions that pull us away from real community. And the part that is your favorite — mine too. Be a torch!! @Meleah – Your welcome, and great to see you here today! @Tabitha – This quote is so uplifting…and when I first read it, I just felt it calling out to become a Sunday post! Continue to do amazing things in your life Tabitha! @Jennifer – Jennifer, know that you do truly shine! And I think you’ve hit upon something – happiness. Looking outward, to be a gift in our world – when we do this with love and caring – true happiness is not far behind. @Dragos – Faking happiness – oh, another great point. Faking happiness is just that – fake. And when we do our life activities with purpose – that is real happiness! @Bri – Taking responsibility vs. blaming and complaining – a great point Bri. When we take responsibility, we also take action. And thats’ what is needed to get us moving in the right direction. @Liara – The idea of us never being used up – I love this point. We always have something to give, even as we near the end. Even if it’s just a smile. Everything we can give of ourselves is a way to spread the goodness described in this quote. @Sagan – I love this idea Sagan! Now…can I remember that come morning? I’m going to give this a shot – so easy, and such an easy way to realize how truly abundant our lives are. Thank so much Sagan!